In a modern world, we often forget to appreciate the gifts of Mother Nature. But now, the Western Mediterranean Development Agency (BAKA) has taken an initiative to revive the tradition of harvesting. It invites people, including tourists, to come together and collect the blessings of nature. It organizes harvesting events for different crops and fruits in Southern Turkey's Isparta and Burdur. As a part of the program, tourists get to enjoy harvesting lavender, rose, cherry and cherry blossoms. Often they become part of agricultural activities while enjoying some breathtaking scenery. Over the last couple of weeks, many tourists from China have come to enjoy grape harvesting at the vineyards in Isparta and Burdur. 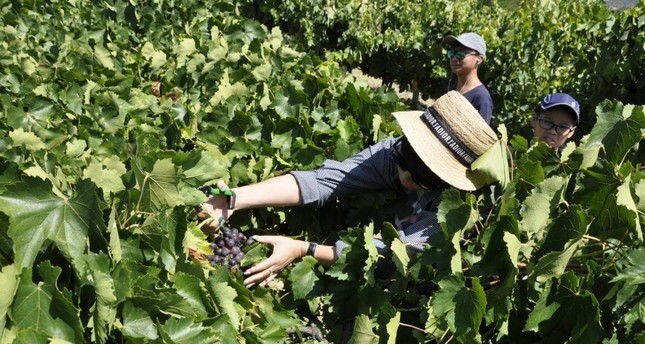 Some 700 Chinese tourists have so far visited the region's vineyards. The harvesting season will continue for a month and the region is expected to welcome more tourists until the season is over. Speaking to Anadolu Agency (AA), Yasin Çubukçu, a grape farmer, hosted the first group of tourists in his vineyards. He said that harvest tourism in the region began with rose and has been growing rapidly ever since. "This year we hosted almost 40,000 local and international tourists during the rose harvesting season. Now, it is time for grape. Tourists pick up grapes, take a tour around the village on tractors, enjoy a Turkish breakfast in the village and taste the local meals," said Çubukçu. İzzet Kocabıyık, a guide for the Chinese tourists said that the harvest tourism will continue throughout the year. "This is a beautiful place and harvesting all these crops make tourists feel like going back to nature. I recommend everyone to come and see the region and become a part of the harvesting activities. This is a beautiful place where beautiful people live," he said. The Chinese tourists enjoying the harvest tour said they were amazed by the landscape and enjoyed harvesting as well as the local cuisines.